There is a feeling of being thin and fitting to the hand, and the feeling to the fingertip at the time of work is secured and it can be used for detailed work. 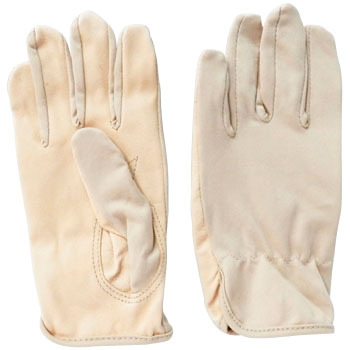 However, because it is easy to break the boundary between the cloth and leather parts, we wear and use a smus over this glove. Summer has the advantage of being less stuffy. We tried variously, but think that it is easy to use first now and thinks that it is very glad that women have S size. This review is about item#7579871. Because it is thin, it is easy to use for fine work, so we can reduce stuffiness due to the cloth side because it is cloth side. However, the item purchased this time had variations in the quality of the leather, and there was a thing with small holes in it and it soon broke. Please keep constant quality. This review is about item#7579862. First, sewing of the little finger on the left hand side is not good. There is no hole stuck with a needle on the skin, and only the fabric on the shell side is sewn. Although it is a brand new, there is a hole (haha) Unpleasantness of what fingers do not come out. Although I use it without any help, I am really strong. I want the quality check to be thorough. I was betrayed by expectations in a good way and a bad meaning. This review is about item#07579871. I purchased this glove for driving as the hand is rough in winter. I am using it all the year after all. Since there are two cars, it is an additional purchase this time. If you dry it after sweating it will make the leather a little hard, but if you apply a thin leather cream it will not be a problem and will last longer. It is thin, and the fit feeling is good in the hand. I am allergic to rubber, so I am wearing these gloves when I sprinkle water. Then, the yellow color of the gloves got in my hands, and the color does not fall easily. I want you to remove the yellow coloration. I am using it after washing the whole thing. The leather part is thin and very easy to use, but the part of the instep is weak to heat and the hole opens immediately. This review is about item#07579887. I like the softness which is very good fit, I'm a bit sorry that the price went up. It fits perfectly in the hand and is very easy to work. This review is about item#07579862. It is thin compared with thick skin, rubber products, so the hand feels good. Although it used it several times, it seems not to be torn. It is best if you last long.